Having been to Milan during the weekend and having thoroughly enjoyed myself in that fair city, I came home and reviewed the few photos I had taken. 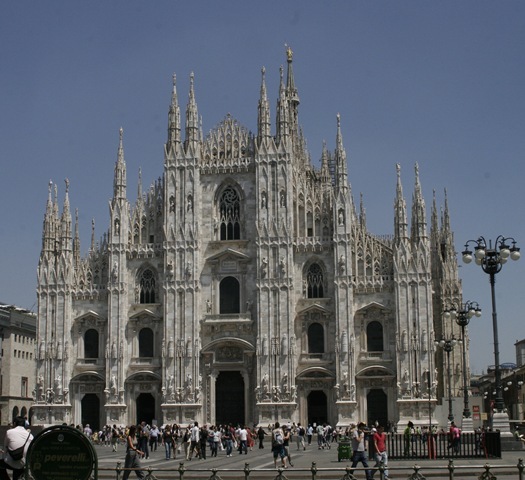 Like every tourist, I took pictures of the great Duomo Cathedral. It has been recently cleaned and stands now, pristine, a white and sandy coloured Catholic monolith. I am not religious by any means, I was simply admiring the architecture. My wife wondered if we should go inside. Then we saw the queue to get in and decided against it. The reason for the queue? Well, that is what was truly amazing. Since when, I wondered, and why, has it been necessary to have the police and the military, not to mention the Caribinieri, search people and their belongings when going into a church? I couldn’t help myself. I had to have pictures. There is something wrong here, isn’t there? I can only imagine the outcry if it was a mosque we were talking about, but a Catholic Cathedral in Italy? Does the pope know about this? I wonder who they are afraid of? The protestants? This entry was posted on June 17, 2009 at 9:27 pm	and is filed under Generic. You can follow any responses to this entry through the RSS 2.0 feed. You can leave a response, or trackback from your own site. Bad as Europe is, you might want to stay there for a while. Wow! Thanks for the link. I may be quoting some of your stuff. If that’s ok with you…? It’s not my stuff. I’m just quoting things I find, so use your own judgment. I try to be careful, but sometimes I’m wrong (not often, because I do try to be careful). Anyway, use your judgment, and do as you think best. If I’m wrong about anything, I wouldn’t want you to be hurt by it. That stuff may be a bit overboard on Obama (maybe not), but even if it is, Obama’s policies will not be good for America, Israel, or the World. I don’t know where to hide from the decay that is coming to the world. There may be nowhere. But whatever happens, it’s from Hashem, and whatever else we do we need to acknowledge that. The end WILL be good, but till we get there things may well be very difficult. It’s no surprise that some of the Jewish Sages said they didn’t want to be here in the days immediately preceding Moshiach. It will end good, but getting there WILL be rough!